(West Chester Buzz Nov 8, 2012) Ground was officially broken Thursday on what Home Builders Association of Greater Cincinnati executive director Dan Dressman called “one of the nicest locations” that has ever hosted its premier home showcase. Carriage Hill, which will have eight homes in this summer’s Homearama, features lakes, streams and woodlands spread throughout the 400-arce Liberty Township community. “It is a one-of-a-kind location. It is really an oasis,” Dressman said. “As far as we are concerned it is one of the nicest, if not the nicest locations we have ever had at Homearama over the last 50 years. The homes featured in the 51st Homearama will be priced between $700,000 to $1.2 million. Of the eight homes in the show, two have already been sold. Dressman is also anticipating that a couple more will be sold in the next few months. “If you are thinking about building a new home over the next year, this is a opportune time to get a lot of extras without having to pay for them,” Dressman said. 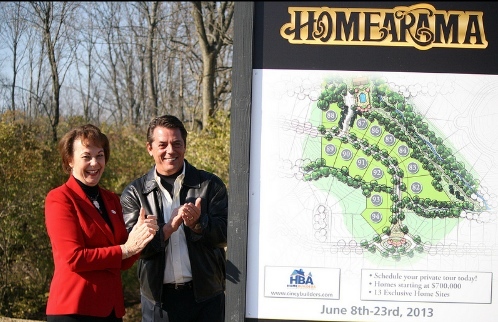 In the 50-year history of Homearama, Butler County has hosted 10 home showcases. In 2011, the event at West Chester Township’s Foxborough residential development attracted more than 20,000 people. Carriage Hill co-manager Randy Terry is hoping the 2013 showcase will bring that type of attention to his development, which began selling homes in late 2011. “Bringing 20,000-plus folks through the community next year and giving them an opportunity to experience Carriage Hill will certainly broaden the awareness and create the kind of excitement in a community that people are looking for,” Terry said. The appeal of the community has already helped sell homes. Terry said Carriage Hill has exceeded its own goals by selling 35 homes in 2012 and is projecting 40 more sales in 2013. Among the custom builders in the 51st Homearama showcase, which will take place June 8-23, are Daniels Hicks Homes, Justin Doyle Homes, The Leland Group, Robert Lucke Group, Potterhill Homes, Somerset Custom Homes, W.V. deStefano and Jack H. Wieland Builders.